Microsoft Windows provides one of the best features in the form of NT Backup utility to create replica of users' data files and to save that information from unforeseen data lost situation. However, in case, original data files gets damaged and deleted then, you can get back that crucial data with the help of this application tool. Demo Version can of this utility can enable to view the recovered elements but you cannot save the recovered elements directly onto your system. You can conveniently recover corrupt and damaged backup files. This software provides Extracting option that can help you to "Extract Files" from the damaged BKF file. 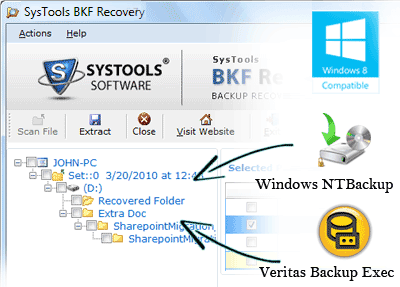 This technically advanced Windows backup recovery software offers Advance Search option for quick search. The software fluently runs with all Windows versions. It can restore all the kinds BKF files i.e. NTbackup Exe and VERITAS/Symantec Exec. This software is relevant to resolve all above mentioned issue. This BKF File Repair application tool can proficiently recover your significant files without any alterations.